There were chaotic scenes after a filibuster attempt fell just short and protesters cheered, clapped and shouted from 11:45 p.m. to midnight and beyond as lawmakers tried to hold the vote before the session ended at midnight (1 a.m. ET). 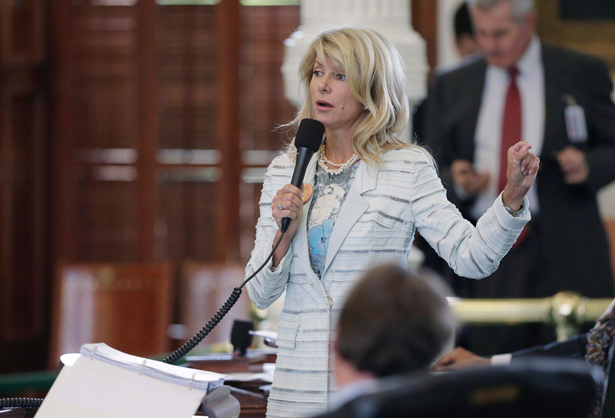 The filibuster by Senator Wendy Davis, D-Fort Worth, who wore a back brace, lasted almost eleven hours but ended after three challenges to her speech were upheld. The only way Democrats in the Republican-controlled Senate could defeat the measure was by not letting it come to a vote on Tuesday. Pro-choice activists packed the Capitol in Austin all day and night, and at points the livestream of the proceedings (provided by The Texas Tribune) had well over 100,000 viewers watching around the world. And Twitter activity around the filibuster soared. Planned Parenthood President Cecile Richards said in a statement, “Gov. Perry knew all along he couldn’t pass this bill by the books. He and his allies resorted to shutting down the debate, blocking testimony from the very women whose lives would be affected, voting in the middle of the night, and employing cheap tricks to try shut down a heroic filibuster by Senator Wendy Davis.” On the Republican side, Lieutenant Governor David Dewhurst said he was “very frustrated” with the days events, blaming the bill’s failure on “an unruly mob using Occupy Wall Street tactics,” according to The Texas Tribune. When combined in a state 773 miles wide and 790 miles long and with 26 million people, the measures would become the most stringent set of laws to impact the largest number of people in the nation. “If this passes, abortion would be virtually banned in the state of Texas, and many women could be forced to resort to dangerous and unsafe measures,” said Cecile Richards, president of Planned Parenthood Action Fund and daughter of the late former Texas governor Ann Richards. Today’s filibuster is a last-ditch effort on the part of Texas Democrats to block the bill, which, if passed, would close thirty-seven of the forty-two abortion clinics in Texas, all but eliminating abortion access in the state. Read more on the history of the bill and the fierce activism around it at RH Reality Check, and find out how to help in the effort from Texas activist Jessica Luther here.